« Homepage / Anatomy / "Kinin-kallikrein system"
The kinin-kallikrein system or simply kinin system is a poorly delineated system of blood proteins that plays a role in inflammation, blood pressure control, coagulation and pain. 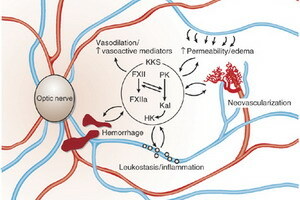 Its important mediators bradykinin and kallidin are vasodilators that Act on many types of cells. The system was discovered in 1909 (Abelous & Bardier) when scientists found that the injection of urine (to high in kinins) result in hypotension (low blood pressure). The researchers Emil Karl Frey, Heinrich Kraut and Eugen Werle discovered the high molecular weight kininogen in urine around 1930. The system consists of a number of large proteins, some small polypeptides and a group of enzymes that activate and deactivate the compounds. The high molecular weight kininogen (KHPM) and the low molecular weight kininogen (KBPM) are the precursors of polypeptides. They have activity in themselves. KHPM is produced by the liver with the prekallikrein (see below). It mainly acts as cofactor on coagulation and inflammation, and it has no intrinsic catalytic activity. KBPM is produced locally by numerous tissues, and secreted with tissue kallikrein. Bradykinin (BK), which acts on receptor B2 and B1, slightly is produced when kallikrein releases the the KHPM. It is a nonapeptide with the amino acid sequence Arg-Pro-Pro-Gly-Phe-Ser-Pro-Phe-Arg. Kallidin (KD) is released from the KBPM by tissue kallikrein. It is a decapeptide. Kallikréines (tissue and plasma kallikrein) are serine proteases that liberate kinins (BK and KD) of the kininogen. The prekallikrein is the precursor of plasma kallikrein. It can only activate kinins after having been activated itself by factor XII or other stimuli. Carboxypeptidases are present in two forms: N circulates and M is membrane-bound. They remove arginine residues to the terminal group carboxy of BK and KD. The enzyme ACE (ACE), also known as kininase II, inactivates a number of peptide mediators, including bradykinin. We know better for the activation of angiotensin. Neutral endopeptidase also deactivates kinins and other mediators. Inhibition of ACE with ACE inhibitors causes a decrease in angiotensin (a vasoconstrictor) but also an increase in bradykinin due to a decrease of degradation. This explains why some patients under IEC develop a dry cough and some react with angioedema, a dangerous swelling of the head and throat. Assumptions indicate that many of the beneficial effects of ACE inhibitors are due to their influence on the kinin-kallikrein system. This includes their effects on high blood pressure, ventricular remodeling (after a myocardial infarction) and possibly diabetic nephropathy. The defects of the kinin-kallikrein in diseases system are generally not accepted. The system is the object of much research due to its relations with the inflammation and blood pressure systems.